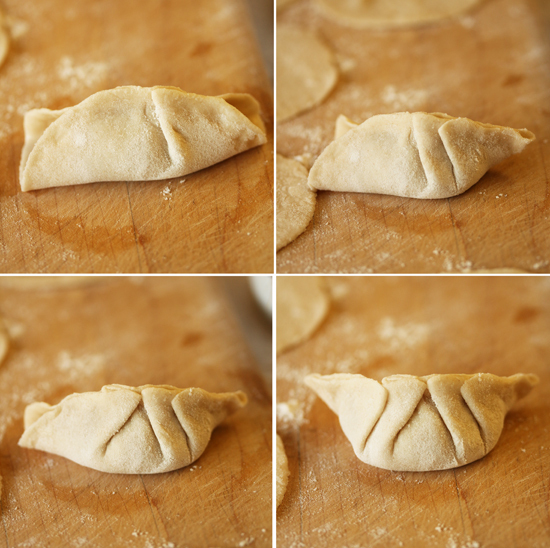 About a month ago I showed you how to make your own gyoza wrappers, and then I left you hanging. You were probably thinking to yourself… but, but, but…what about filling and cooking them? Well, truly, I wouldn’t leave you in the lurch like that, but after I made them it was dark outside, so I froze my pot-stickers to shoot on a better day. Sorry. Yesterday I took my dog and pony show to my friend Michele’s house for a 6-course tasting feast, featuring some of my most recent recipes adventures. I prepared about a quarter portion of each dish, starting out with my frozen Pork Pot-Stickers. In fact the photos of the plated dish were shot at her house. We also had Beef Carpaccio with Salmoriglio Oregano Sauce, Burritos with Achiote Chicken, Pork Chile Verde with Ancho Chile Sauce, Lamb Shepherd’s Pie and Orange Marmalade Cake. Now that I look at it, that sounds pretty heavy and meaty, but it took us 5 hours from start to finish, with lots of girlfriend talk, of course. Yes, we were stuffed at the end, but so happy, you know. Replete. I think what makes or breaks a pot-sticker dish is the dipping sauce. The sauce with this recipe is just a knockout. You can smell it from the next room. Soy sauce, lemon juice, rice vinegar, brown sugar, grated fresh ginger, sesame oil, sriracha. Don’t tell anybody, but I think I drank what was left in the bowl after the pot-stickers were gone. Shhh. The filling is a combination of ground meat and minced cabbage. I mean finely minced. The cabbage and meat are thoroughly combined. 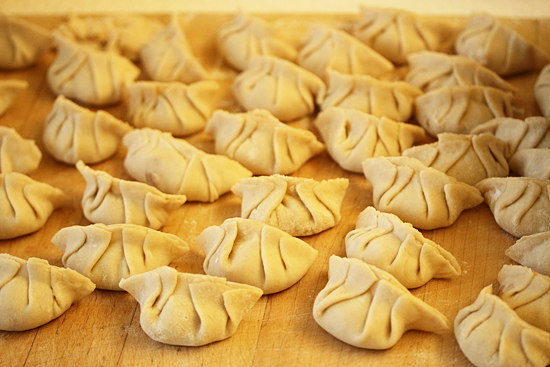 About 2 teaspoons of filling are used for each pot-sticker. The edge is brushed with water. First the 2 edges are brought up and pinched together on the top, leaving the sides open. Each side is pleated 2 times toward the center and the whole top edge is pinched together to secure it. I felt quite proud of myself when I finished making all the pot-stickers. Especially since you can buy big plastic bags of frozen pot-stickers at the Asian market already made. I’m pretty sure mine taste better, particularly with the home-made gyoza wrappers. I didn’t shoot the cooking part, but it is so easy and fast. You brown the pot-stickers in a non-stick pan in a little sesame oil, then add water, cover and cook until translucent. When the water is evaporated, the cover comes off and the pot-stickers are browned a little more til crispy. Voila. Done. Devour. 1. In a medium bowl, whisk together dipping sauce ingredients and set aside. Serve in small bowls about 4 inches in diameter. 1. 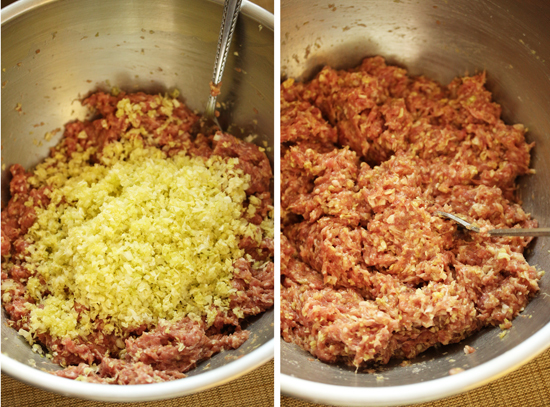 In a large bowl, mix the ground meat with the water, sherry, soy sauce, sesame oil, salt and ginger. 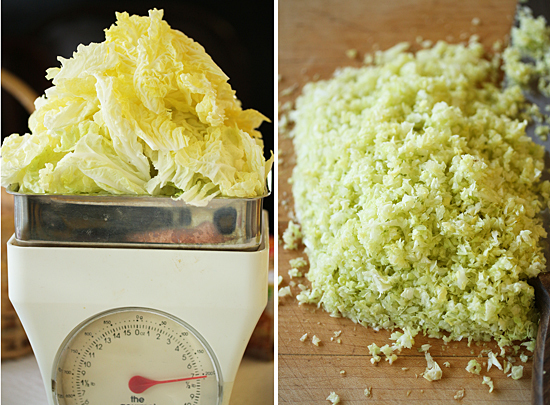 Add chopped cabbage and mix to thoroughly blend. 1. On a very lightly floured work surface, working with 1 wrapper at a time, place about 2 teaspoons filling on center of wrapper. Brush edge of wrapper sparingly with water, making sure to cover entire edge. 2. Fold wrapper in half, pinching the top center together, but leaving the edges open on both sides. 3. Make pleats on one side only of wrapper. Make 2 small pleats on either side of pinched middle, folding the dough over onto itself with the pleats facing the middle of the dumpling. If pleat will not stay flat, brush inside of pleat with moistened finger and press together. 4. Pinch along the top of dumpling to seal pleated and unpleated sides. You now have a pot-sticker which is curled naturally with a wider bottom to sit in cooking pan. 5. Fill and pleat remaining gyoza wrappers. 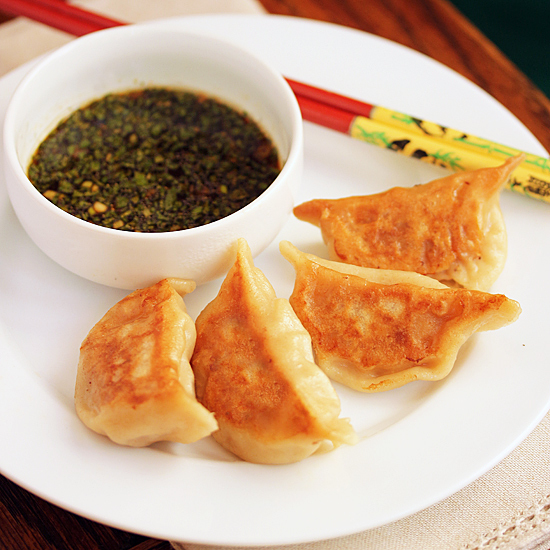 Pot-stickers may now be fried or frozen. Note: If freezing, place on sheet pan, not touching, until solid (about 1 hour), then place in freezer ziplock bag. May be frozen for up to 2 months. Do not defrost to cook, just cook them a few minutes longer. If frozen dumplings acquire cracks in wrapper, defrost slightly until a moistened finger can smooth crack back together. 1. In a large sauté pan with a tight fitting lid, heat 1 tablespoon oil over medium low heat. Add pot-stickers so they are not touching, flat side down with pleated edges up. Cook dumplings until lightly browned, about 10 minutes. 2. Add water to pan, cover and cook over medium heat until all water has evaporated, about 10 minutes. Check half way through and add more water if necessary. 3. When dumplings are translucent, filling is firm and water has evaporated, uncover and fry until golden brown. Add more oil drizzled down side of pan, if needed, to keep dumplings from sticking to pan. Transfer with spatula to serving plate, preferably browned side up. Serve with Lemon Soy Ginger Dipping Sauce. Wow, such a pro! I think you’re ready to start a magazine! Potsticker perfection! I want to hang with you and Michelle! 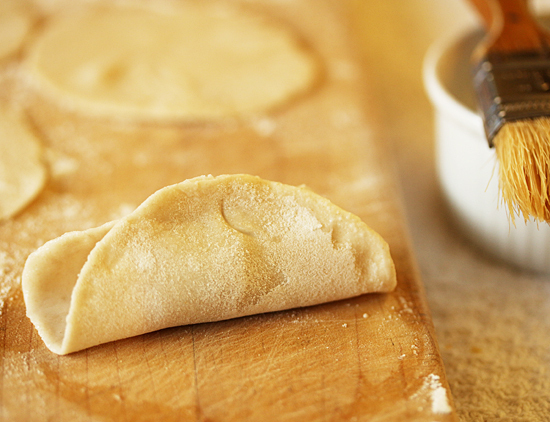 Your pot stickers are beautifully shaped and browned. I’m impressed that you made the dough too. Wow! 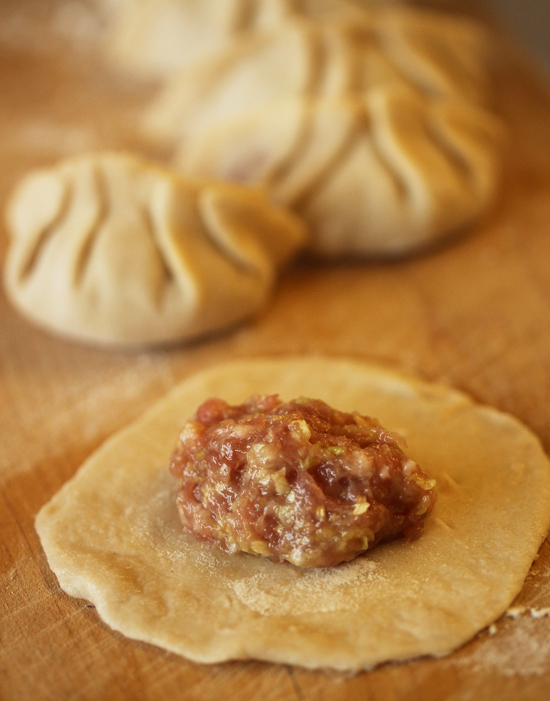 My name is Fran and I came by your blog ‘accidently’ while searching for potsticker recipes. 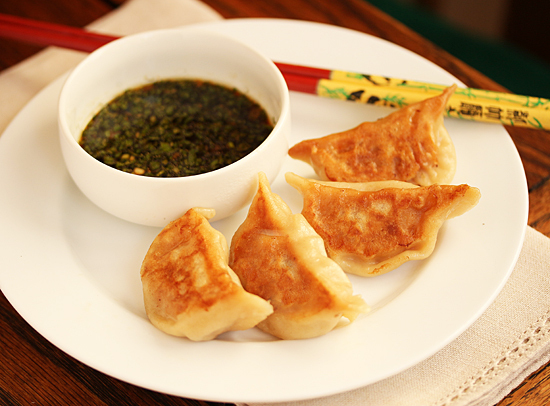 I recently made my potstickers with ready-made wonton wrappers but one day I’ll give your homemade recipe a try. I attended UCLA back in the early 1970’s- I wasn’t aware that they have cooking classes there! I just finished studying cuisine at Le Cordon Bleu in Paris, so like you, I like to try slightly different recipes! Glad to meet you!